But Isabelle has no idea her new "friend" is the hired help, and Maude's very existence among the aristocracy hinges on her keeping the truth a secret. Yet the more she learns about Isabelle, the more her loyalty is tested. And the longer her deception continues, the more she has to lose. Belle Epoque, the debut novel by Elizabeth Ross was not the book that I was expecting to read when I opened it. I allowed myself to be misled by the synopsis and thought that I was getting a Cinderella/Ugly Duckling story. I am so glad that I was mistaken. Maude Pichon was a girl who ran away from an arranged marriage in the north of France (yes, I had to cheat to see where Brittany actually was, geographically speaking) to the glitz, glamour, and beauty of Paris. The book opens with Maude learning that the world is a much bigger place than she ever imagined. Despite grabbing what she believed to be a large amount of money from the till at her father's store, she quickly finds that life in the big city is expensive and cruel. In order to make ends meet in the most undemanding way possible, she finds herself working as a repoussoir - an ugly individual hired to make the employer more attractive by comparison. She is initially against the degrading work, but finds herself playing a poor country cousin debutante for the Parisian social "season". Before I say anything else, I want to touch upon how beautifully Ross crafted the setting of the novel. I felt like I was deep in the narcissism of nineteenth century Paris, surrounded by class division, worship of beauty, obsession of art, and derision of the new (like the mid-constructed Eiffel Tower). I've never been to Paris in person, but I felt like I had almost been there while experiencing it with Maude in Belle Epoque. I had a lot of respect for Maude doing what was necessary to survive on her own terms, far away from her comfort zone. Though she did thought being a repoussoir was distasteful, she did her job to the very best of her ability. Her treatment of her unknowing "charge", Isabelle, also made me think higher of Maude. She managed to stay true to herself in the face of Paris' intoxication, having few missteps. I think Belle Epoque is a book that speaks volumes about society, despite being set more than a century ago. It analyzes what it means to be beautiful, and where the importance of it should fall in comparison to other things such as self-respect, honesty, friendship, and loyalty. I think Elizabeth Ross did the very best possible thing with the book by not turning it into a fairy tale. Maude was treated as a real girl, with real issues, with who twenty-first century teens can easily relate. 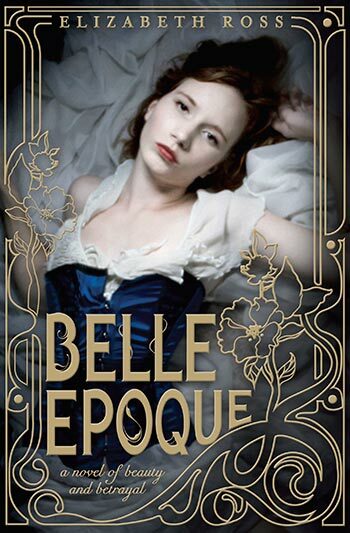 I recommend Belle Epoque to anyone who is looking for a heroine who strives to make her life her own or enjoys reading historical fiction that comes across very realistically. While being a young adult novel, I think it can also appeal to adult readers with it's beautiful setting. I look forward to reading more works by Elizabeth Ross in the future. To satisfy FTC guidelines, I am disclosing that I received an advance copy of the book briefly for reviewing purposes through DAC ARC Tours in exchange for an honest review. The book was likely provided to the tour by the publisher or author, which has in no way affected the outcome of my review. All opinions expressed are rambling, honest, and completely my own.